Faturator is at heart a distortion unit, built to do everything from adding subtle and warm gritty character to your sounds to slam them into a wall of heavy saturation and digital fuzz. Contrary to many distortion effects, Faturator will preserve the dynamics of your sound and dirty up your sound regardless of input gain. Faturator can also color the input to emphasize a specific tone of the sound, or throw some stereo width into the mix. Everything to give you a fast and easy way of making any input come alive. Faturator also works as a 'snapin' in the Kilohearts Snapin Host plugins like Multipass and Snap Heap. 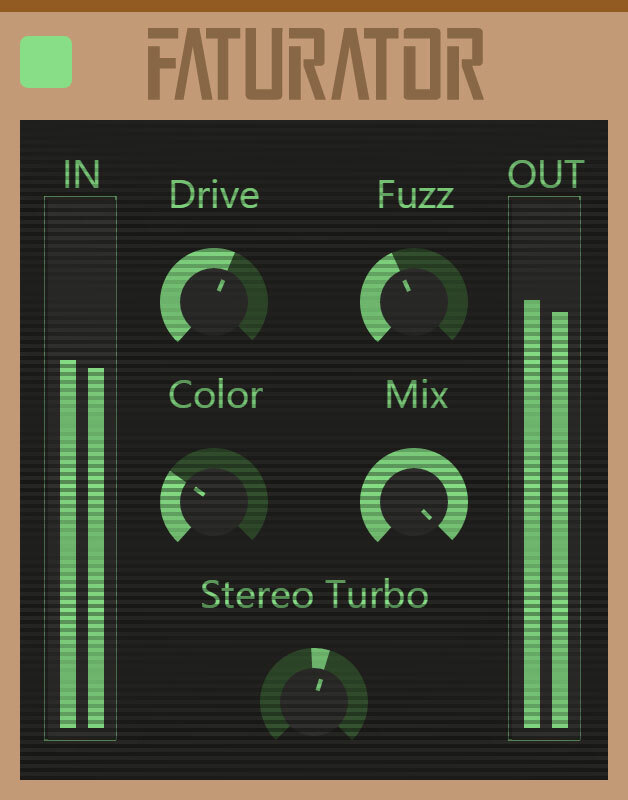 Faturator is also available as a Rack Extension for Reason over at the Propellerhead shop. Grabbed faturator the other day because I can't get enough distortions and I am very pleased. First of all the best part is no matter how much nasty crunchy gruesomeness you put on your signal the output level is virtually the same as your input. I've been hoping to find a distortion unit that has some kind of auto-gain feature and this is it. It sounds great the drive slider sounds like regular saturation and the fuzz adds the grit. Also when I first downloaded it I had an issue where the UI would pop up and freeze my whole daw so I contacted support and they got back to me and had a bug fix for it in less than 24 hours! Outstanding support. For 19 dollars you can't go wrong I highly recommend it. Now I'll be saving up my pennies for their new multipass fx plugin. 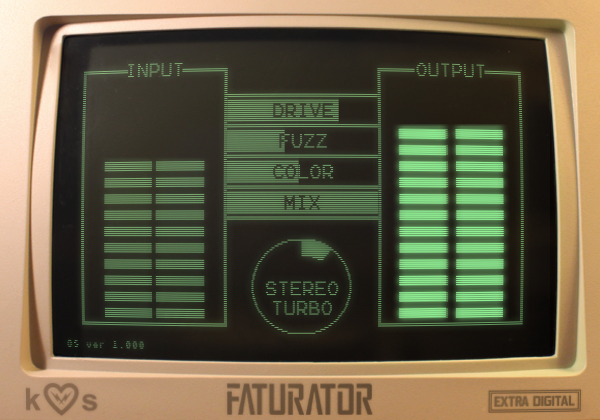 Faturator by Kilohearts is a simple, yet powerful saturation plugin. With the turn of a big knob (stereo turbo) and a few sliders (drive, fuzz, color, mix) you can add anything from subtle, warm, clean color to severe, dirty, digital mayhem. It is surprisingly flexible. It works well on drums, guitar, synth, and vocal tracks (when used sparingly to add an edge). It also sounds great on basses — really fattens up the low-mids and subs. Simple, yet powerful (not too many controls). Nice sound, free of harsh, unwanted aliasing. CPU friendly (didn't notice much usage at all). Responsive developer (frequent updates and great communication). None come to mind — just a word of caution: a little Faturator goes a long way. I advise tweaking until you hear the desired effect and then backing off ever so slightly to avoid overkill — unless of course that's the sound you are seeking. With Faturator, you can effortlessly add width and loads of color without sacrificing dynamics. It is very capable of adding a full range of sound — from warm to cool to freezing cold. Note: This is not an analog tape simulator plugin, but it's no slacker when it comes to adding modern distortion and oomph! I highly recommend Faturator to any eMusician, producer, film/video/game scorer, DJ, sound designer, etc., who is looking for a sonic secret weapon. Tommy Zai gives Faturator two strong, meaty thumbs up. Thank you, Kilohearts, for creating this fantastically fuzzy plugin.